This popular text mixes classic theory and research on urban politics with the most recent developments and data in urban and metropolitan affairs. Its balanced and realistic approach helps students understand the nature of urban politics and the difficulty of finding effective "solutions" in a suburban and global age. The ninth edition has been thoroughly rewritten and updated with a continued focus on economic development and race, plus renewed attention to globalization, gentrification, and changing demographics. Boxed case studies of prominent recent and current urban development efforts provide material for class discussion, and concluding material demonstrates the tradeoff between more "ideal" and more "pragmatic" urban politics. Increased coverage of policies for sustainable urban development. 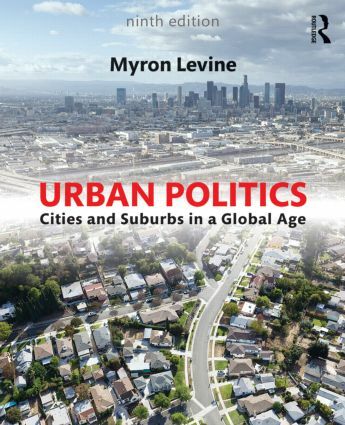 Myron A. Levine is Professor in the Department of Urban Affairs and Geography at Wright State University, USA. In addition to authoring Urban Politics, Dr. Levine is the editor of two volumes, Annual Editions: Urban Society and Taking Sides: Urban Affairs. His writings have appeared in various journals, including the Urban Affairs Review and the Journal of Urban Affairs. His research focuses on national urban policy, urban revitalization, and efforts at regionalism and local government collaboration. He has received NEH and NSF awards to study and teach in France, Germany, the Czech Republic, Slovakia, and Latvia.